This document has been prepared by CEN/WS XBRL, the secretariat of which is held by NEN. — Part 1: European data point methodology for supervisory reporting. This document is intended to provide guidelines to European regulators in the implementation and roll out of the reporting standard using XBRL across Europe. The set of recommendations included in this document aim to facilitate the implementation of European National Supervisors to adopt XBRL in any of the reporting frameworks. The following sections will provide guidance on the use, understanding, preparation, and extension of their filings in eXtensible Business Reporting Language (XBRL). This guidance is in the form of notes in association with the pertaining requirements clause and uses the terms “should” (recommendation), “may” (allowance) and “can” (possibility). Organizations wishing to implement this CWA would be expected to consider all recommendations where the term "should" is used. COREP, FINREP (and Solvency II or other future) XBRL taxonomies are offered to European regulators for national implementation. The first releases (2006) of the COREP and FINREP XBRL frameworks have proven that a standardized technical roll-out package is needed to increase the adoption rate and avoid implementation variances, which have a detrimental effect on the overall cross-border effectiveness of using one reporting standard. As well this roll-out guide tries to promote the economies of scale for a better adoption. This CWA is a general guide to XBRL oriented towards national regulators on how to implement, extend and manage XBRL taxonomies. The guidance and recommendations included in this CWA have been created for regulatory filings in the context of European supervisory reporting. In this document, “regulatory filings” encompasses authoritative financial reporting standards and generally accepted accounting principles/practices (or GAAP), regulatory reports whose subject matter is primarily financial position and performance and related explanatory disclosures, and data sets used in the collection of financial statistics; it excludes transaction- or journal-level reporting, primarily narrative reports (for example, internal controls assessments) and non-financial quantitative reports (for example, air pollution measurements). This section describes how the XBRL standard can be implemented from the regulator's perspective. First, we present different levels of XBRL adoption, to help define the supervisor's strategy. This is followed by a description of the minimum steps required to facilitate initial understanding of the XBRL standard, and guidelines describing the review and the likely impact on existing infrastructure and internal information systems. Finally, we suggest additional considerations which should be taken into consideration during preparation and planning, to help regulators establish which services they need to implement to enable reporting entities to adhere to the XBRL standard. Figure 1 presents an overview of the activities described in the section. Widespread adoption of XBRL as a business information exchange format has revealed a number of implementation alternatives. Selection of a specific adoption strategy by the regulator establishes the roadmap for implementation from the regulator's current reporting framework to a framework which supports the new legislation. This step is probably the most important step in XBRL adoption. Use of XBRL solely for the electronic exchange of data between the national regulator and European Authority to comply with legislation. Adaptation of existing reporting channels to receive XBRL reports from reporting entities as well as using XBRL for the electronic exchange of data between the national regulator and the European Authority. In this scenario, regulators could make use of automated business rules to validate data received from reporting entities. Full exploitation of XBRL for internal reporting models (multidimensional data analysis) in addition to the use of XBRL for receiving data from reporting entities and electronic exchange between the national regulator and the European Authority as described above. Depending on the strategy selected, the regulator must also determine which XBRL enabled software applications should be made available to their internal departments and also to reporting entities under their jurisdiction. To name a few examples for consideration: XBRL validation, report visualization, conversion from existing data formats, filing forms, monitoring, security enforcement and versioning that will facilitate the analysis and supervision of reported information. From the regulator's perspective there are two main key drivers in favour of XBRL adoption: compliance with new regulation directives and ensuring the accuracy of data reported by reporting entities. Compliance with new regulation directives implies the adequacy of the reporting business models and rules to the XBRL language and semantics to be implemented. preserved during the data transfer process. how the data models correspond to the business model and semantic rules into XBRL syntactic schemas and filers forms that define reporting data. Consider information requirements which could have causes additional issues to be solved in the modelling architecture. Many are approaching as compliance requirements driven by a new reporting directive. An alternative approach is considering XBRL adoption as a technology evolution of current reporting systems to take advantage of this standard and reap the benefits of a standardised electronic exchange format. In general, successful XBRL implementations usually do not change the business models, just the report format resulting in a transparent use of XBRL to the end users. It is specially recommended to apply a structured methodology for data modelling. On this topic the Eurofiling architecture approach is proposing a methodology on normalization called Data Point Modelling. This will be introduced later in Section 5, but mainly consists of defining a method to model dictionary data, their aspects and relationships in terms of domains and hierarchies, business validation rules and the corresponding classifications of the data in different tables and forms for filing and visualization (figure 2). How this data inherited from the European frameworks fits into the national reporting model. Study if the current information models for reporting entities have more disclosures or information. In case more detailed information is required, knowledge on the extension of European taxonomies is needed. This will be detailed in Section 4. How many different reporting templates do we need to receive from reporting entities? What is the frequency of this reporting information? Quarterly, semi-annually, annually? What is the minimum reporting unit of information expected to receive (one template, one module, one table, one fact, other)? What is the profile of reports (minimum and maximum size expected) to be received keeping a margin of security for processing? What response time is needed to process received reporting information? Will it be allowed partial submissions? Or will all data need to be reported in full? What is the minimum precision accepted for data? Will it be allowed for reports to be re-submitted if the reporting entity wishes to submit an amendment? Will It be placed any deadlines for receipt of any amendments? If regulator has well established data collection mechanisms in place, it will be necessary to adapt these mechanisms to accept XBRL instance documents, including additional workflows (submit and feedback loops) for the validation of header information and XBRL validation (following recommendations documented in “CEN WS XBRL CWA2 as valuable initiatives to take into consideration). Select which additional services could be provided as part of the submission protocol from reporting entities to national regulator, for example tracking or monitoring submitted reports, visualization of XBRL instances, pre-validation including formulae which defining regulatory requirements, display the specific data set (templates) that each reporting entity is expected to fulfil, etc. Regulators who elect to adopt XBRL for internal information systems will need to consider how to adapt existing systems for XBRL integration and data analysis. All national regulators across Europe are responsible for defining their local regulation and communicating with their reporting entities. Existing, internal systems vary significantly between national regulators and some will need to adapt more than others to meet the new European directives. The purpose of this section is to establish a common set of high level guidelines based on current best practices that could apply for the internal use of XBRL in regulatory reporting to help realise the benefits of using a standard method of data exchange across Europe. The European framework and the XBRL International abstract model version 2.0 provide a clear method to enable consistent definition of business information. Aligning the adaptation of internal systems with align those methodologies is foreseen as the key to driving better regulatory practice across Europe. Making use of automated business-rule validation on reported data will help to assure high quality data and reduces the processing time associated with manual checks allowing more time to analyse and dedicate to analysis real supervisory activity. The creation of data-warehouses based on XBRL taxonomy frameworks and models will facilitate access to reporting information through the different perspectives of regulatory reporting (compliance, risk, prudency, transparency). reuse and take advantage of native XBRL formula validation across multiple reporting documents to ensure the quality and consistency of the data submitted by the reporting entities saving time and effort in the process using multi-instance sub-module of the specification. Once the regulator has defined all reporting requirements and project plan to adapt information systems to support the exchange of reporting information using XBRL, it will be required to establish a clear plan for communicating the new regulatory process to reporting Entities. This communication need to cover several steps to be actions taken by the national regulator to involve their main reporting entities as early as possible to ensure a smooth transition to new processes and new technology in the process normative. communication of expected timelines for compliance. Other successful XBRL programs around the globe have found it beneficial to create an "Early Adopters" program between the national regulatory Authority and a reduced number of major reporting entities. The “Early Adopters” program can be used to set up an initial proof of concept for XBRL reporting exchange and facilitate the success of a full rollout. to test the performance of services deployed by the national regulator in terms of processing, security enforcement, integrating, analysing and validating XBRL reports. During this section the regulatory supervisor has been able to introduce all the topics required to establish a roadmap to adapt their systems and plan the new reporting information system to rollout. One of the key challenges faced by regulators when adopting the XBRL standard is to fit the reporting requirements set by European frameworks and directives into existing national supervisory and compliance processes. In most of the cases, the flexibility of the XBRL standard will allow the national supervisor to fulfil both requirements. Mechanisms to implement and extend taxonomies are likely to vary from one to another. The objective of this section is to provide a set of guidelines to facilitate a harmonized approach to XBRL implementation collected from previous national XBRL adoptions across Europe. The main objectives in regulatory reporting are: maintain data accuracy, data transparency, regulatory compliance and process interoperability. Taxonomy framework of the European Insurance and Occupational Pensions Authority (EIOPA) for Solvency II. These two authorities have been developing XBRL implementations which form the basis of the European frameworks pillars for supervisory reporting (Basel II, Solvency II and Financial Statements). Eurofiling initiative is an open collaboration between groups of experts, including regulatory reporting experts from EBA, EIOPA, XBRL Europe and other volunteers working on a common project to collect the regulatory reporting practice across Europe. The cross-sector definitions common to Solvency II, COREP and FINREP is most likely to be defined in the  namespace and location. National regulators will use the taxonomies defined by these authorities to implement their regulatory reporting process in accordance with national law and EU directives. In terms of XBRL implementation those National adoption will represent the third namespace owner for reporting (covering the national GAAP)1 as shown in figure 4 below. Table 1 shows an example on the owners and namespaces and owner prefixes for the used to establish the institution that defines the different concepts to be reported in the corresponding models. The use of different levels of reporting definitions identified by the use of owner, namespace, prefix and location, provides a proper method to harmonize the use of definitions and concept frameworks across Europe. For technical details on taxonomy architecture nomenclature refer to CEN Agreement document CWA1. One of the recommendations when extending taxonomies is to fully qualify the schema location URL for the taxonomy resource we are extending, instead of using a local copy or a relative location. Simplicity of the reporting process: the resulting regulatory taxonomy architecture must focus on simplification of instance document creation. Stability: the application of the regulatory taxonomy architecture must minimize the impact of changes resulting from amendments to consuming systems. Consistency: the framework under the regulatory taxonomy architecture must be consistent in design and the taxonomies must be coherent and explicit. Compliance with specifications, best practices and related taxonomies: the regulatory taxonomy architecture must conform as much as possible to the approaches inherited from related projects (Level 1 and Level 2). Maintainability: the regulatory taxonomy architecture framework must be easy for supervisors to maintain. Review and avoid duplicate redefinition of concepts. When extending existing taxonomy frameworks one of the common practices is to redefine a concept that does not match the local definition exactly. This practice should be avoided as far as possible to reduce complexity in the final framework aggregation. The current modularization of taxonomy frameworks and well documented metrics and aspects of the model allows a better adaptation to local redefinitions instead of building a new set of duplicated concepts for local purposes. Avoid redefinition of extended templates. One of the lessons learned from early versions of European frameworks is that the extension mechanism to prohibit relationships or dimension definitions (grey cells not allowed for extended reporting templates) at the end is not a good practice in terms of taxonomy complexity and maintainability. In cases where the reporting template in a local extension is different the recommended approach is to define a new reporting template reusing as many of the existing concepts, metrics, relationships and aspects of the base taxonomy and then compound the concrete local aggregations, table, rendering and views. maintain the coherence and consistency of the base taxonomy model. "Data Point Modelling Methodology" (DPM Methodology )"
This section will introduce regulators to the current design techniques and implementation approach used to represent financial models defined by European Regulators. It is important to become familiar with the terminology used in the European XBRL Architecture and Data Point Modelling Methodology, as these will be the base of best practice recommendations in terms of creating financial models based on European regulatory frameworks. XBRL Abstract Model version 2.0: defines the reference to understand and better design in a separate and consistent form the financial and business models and rules that conforms the aspects, concepts, relationships and formulae of the information to be modelled. Introduce an important decoupling vision for business reporting chain that enables design, architecture and implementation of XBRL. Data Point Model, also known as DPM Methodology: A set of guidelines, based on a long track record in regulatory reporting modelling, describing methods for the definition and identification of the data exchanged in reporting frameworks. It establishes a systematic method to represent and describe the data to be reported. Using a data centric approach where properties are assigned to defined ‘data points’, including all their semantic aspects and relationships to give precision to their meaning. XBRL Architecture: based on the dictionary of concepts modelled previously, this defines the set of technical definitions and rules that will enable the implementation of the model using the XBRL standard language in the reporting systems. This architecture should be used as a reference to ensure common practice across implementations to enable interoperable, consistent and harmonized reporting. To achieve this goal the architecture is intended to provide a set of definitions with a concrete structure to implement the model. It is intended to be flexible and open enough, based on previous XBRL implementation for European financial reporting framework versions, giving conventions in the way to implement the concrete frameworks. Public and Private Financial Statements for National Regulators extending COREP and FINREP taxonomy frameworks are in place in several countries across Europe. National financial statements using GAAP taxonomy definitions based on IFRS reporting. All these initiatives have required several changes in their current IT systems to integrate XBRL. Lack of Native XBRL treatment XBRL considered as a format ignoring the semantic information provided by the XBRL taxonomies. Service Oriented Architectures enable modular implementation in the Architecture Stack. Appropriate to evaluate XBRL requirements, functional services and technical processing capabilities to implement and adapt the information systems. It will enable a proper feedback on results for designing the different processes to build. Design the Functional Architecture and their modules. Review current product market status in XBRL processing, validation and reporting tools. Identify Information systems where to extract, collect, validate, receive or analyze the reporting information. Review the performance requirement on current implementation vs. XBRL PoC results. Identify the interfaces and transformations to be completed to current data information (messaging, data models, validations to run, storage and exploit systems, etc.). Define how to process XBRL information (natively using processors, products or tools, direct programming transformations building custom components, other, etc.). Adapt Development Environment: Integration tools for development teams to provide taxonomy editors/viewers, XBRL Processor for validation and formula editing, APIs to extract and compose data reported to the current integration components to exploit the information). Define or adapt Methodology for XBRL development and deployment. Define or adapt XBRL Process and Services catalogue to orchestrate the XBRL component execution in current integrated systems (different operational flows for XBRL reception, validation, storage and integration on Data Warehouse). Deploy XBRL components packaged with other infrastructure and security services (certificate, signature, reporting management policies, etc.) including performance designs. 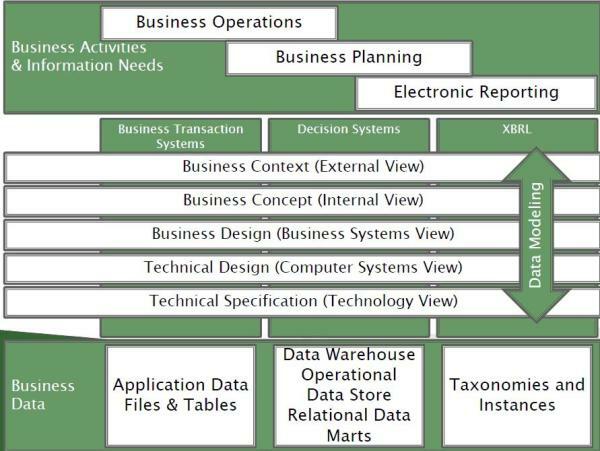 According to The Open Group Architecture Framework (TOGAF2)) architecture lifecycle (figure 6), a XBRL reference Architecture is a concrete specialization of The Open Group distributed Architecture in which services have been implemented to cover the functionalities of the reporting chain. The information presented in this document and the reference documentation indicated at the beginning of the section will provide background information to help regulators to establish the goals of Preliminary phase and steps A and B in the lifecycle illustrated above. The following section focus on steps C and D to complete the reference architecture for XBRL implementations, based on best practice across Europe. For national regulators the Functional Architecture is the first step in designing the building blocks where the architecture layers will be implemented. Platform dependent components to trace, secure, transform, adapt, route and integrate. As a summary, the figure 7 illustrates an overview diagram with the typical technical components and services that make up an XBRL Technical Architecture of Reference. The specific implementation technology selected for these services is fully dependent on each National Supervisor Authority (NSA), and out of the scope of these guidelines. Our recommendation is to invest enough time during the preparation phase to select specific technologies for each service, to determine the optimal solution in terms of products, tools or custom development frameworks and their functional coverage. As a good practice to ensure the success of the solution, we recommend creating a Proof of Concept (PoC) during the preparation phase to verify appropriate technology integration, performance and service quality that is required for the operational system, and allow time for refinement of the initial design. The evolution of this reference architecture is foreseen as distribute computing resources to process data using better computing capacities and storage facilities to optimize by scaling these resources. Several rising technologies like cloud computing and big data analytics are establishing new environments to process and find new correlation on collected information. Those technical architectures oriented towards separation of services implementation are better prepared to be evolved to these new technologies with less effort and investment. According to the TOGAF lifecycle we have introduced the initial steps for XBRL Architecture definition in National Supervisors. The next steps for the regulator will be to identify the concrete service implementation according to their needs. This section describes how regulators should approach maintenance and management of taxonomy frameworks supporting regulatory reporting in XBRL. It explains taxonomy lifecycle and other relevant concepts. XBRL taxonomies3 define and represent the final format for the exchange of financial information between reporting entities and regulators. The taxonomies implements the model defined at a business level. Therefore, any change to normative regulation is likely to require an update to the definitions in the taxonomy. All these changes will need to be reflected in an updated version of the taxonomy framework, i.e. the set of files and resources (called Discoverable Taxonomy Set or DTS) that defines the XBRL reporting systems. All regulators using XBRL should follow a set of best practices to successfully handle taxonomy updates and should also take into consideration the correct synchronization and communication of these versions and changes to their reporting entities. Firstly, the normative taxonomies must be published. One topic that needs harmonization across Europe is to coordinate the different XBRL European reporting taxonomy frameworks and their public repositories and location. Currently there are national supervisor is providing a local copy of the European taxonomy for their national extensions. Using this approach will facilitate the reporting entities to collect and use all corresponding resources for a given taxonomy framework. So the XBRL processing components can retrieve the set of Uniform Resource Locators (URLs) that build up the Discoverable Taxonomy Set (DTS) to be reported. Most reporting systems based on XBRL rely on obtaining a local copy of all distributed resources that conform to the taxonomy framework in their repositories on the Internet, in order to process the information models and to validate the data created in their reporting systems offline. It is good practice to use this cache mechanism from several European taxonomy frameworks in the processing software to gain in efficiency and performance for the reporting applications and systems. National regulators should publish in their website detailed information for the latest version of their extension taxonomy created. 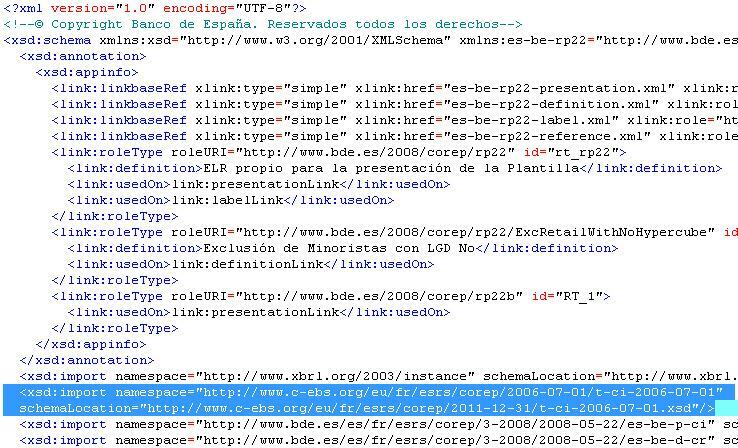 This information should include: Links to previous versions and the dates for which they were in use, schema file names and namespaces, URLs of published documents, date and versions of taxonomy resources for the local national extension and references to the external European authority resources and common definitions. The reporting entity should use software capable of to retrieve all files in the corresponding Discoverable Taxonomy Sets (DTSs) to check if the cached version stored in the local copy corresponds to the last one published by the national supervisor in order to process XBRL reports. The Eurofiling project is an open joint initiative of the European Banking Authority (EBA) and the European Insurance and Occupational Pensions Authority (EIOPA) in collaboration with XBRL Europe, as well as stakeholders as banks, solutions providers, academics and individuals. Eurofiling's main contributions are Data Models, XBRL taxonomies, know-how and documentation for Supervisory Frameworks: COREP, FINREP and Solvency II. Before and during the financial crisis in 2007 and 2008, the European Parliament has called for a move towards more integrated European supervision in order to ensure a true level playing field for all actors at the level of the European Union and to reflect the increasing integration of financial markets in the Union. As a result, the supervisory framework was strengthened to reduce risk and severity of future financial crises. The European System of Financial Supervisors comprises three European Supervisory Authorities, one for the banking sector (EBA), one for the securities sector (European Securities and Markets Authority, ESMA) and one for the insurance and occupational pensions sector (EIOPA), as well as the European Systemic Risk Board4 . To achieve a high level of harmonization and strong convergence in regular supervisory reporting requirements, the EBA has been developing guidelines on supervisory reporting with the aim of setting up a supervisory reporting model with common data definitions. The Guidelines on Financial Reporting cover consolidated and sub-consolidated financial reporting for supervisory purposes based on IAS/IFRS (International Accounting Standards/International Financial Reporting Standard) as endorsed by the European Union. The original Guidelines on FINREP were issued by the Committee of European Banking Supervisors (CEBS) in December 2005. Agreed changes in IFRS were incorporated into the latest FINREP V1 published in December 2009. Due to Capital Requirements Regulation under CRD IV, further major changes to the accounting standards which will impact COREP and FINREP during 2013. 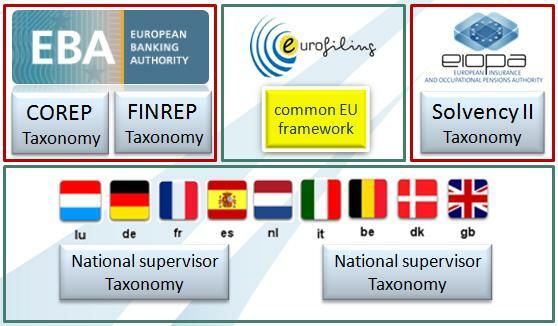 The revised COREP and FINREP Taxonomy is expected to be published by the end of 2013 to take into account the new Implementation Technical Standard of these requirements. The European Insurance and Occupational Pensions Authority (EIOPA) was established in consequence of the reforms to the structure of supervision of the financial sector in the European Union. The reform was initiated by the European Commission, following the recommendations of a Committee of Wise Men, chaired  by Mr. de Larosière, and supported by the European Council and Parliament. EIOPA’s core responsibilities are to support the stability of the financial system, transparency of markets and financial products as well as the protection of policyholders, pension scheme members and beneficiaries. EIOPA is commissioned to monitor and identify trends, potential risks and vulnerabilities stemming from the micro-prudential level, across borders and across sectors. EIOPA is an independent advisory body to the European Parliament, the Council of the European Union and the European Commission. The Solvency II Directive 2009/138/EC is an EU Directive that codifies and harmonises the EU insurance regulation. Primarily this concerns the amount of capital that EU insurance companies must hold to reduce the risk of insolvency. Once the Omnibus II directive is approved by the European Parliament, Solvency II will be scheduled to come 8)9) into effect. DPM Methodology. Data Point Modelling (DPM) Methodology. http://www.eurofiling.info/cen/wp-content/upLoads/data/DPM_methodolgy.docx Morilla, Victor. Eurofiling. This page was last modified 13:06, 18 December 2013. This page has been accessed 800,750 times.